Cozy associations with the People’s Republic of China (PRC) are nothing new for either former President Bill Clinton or his wannabe President wife Hillary. It is only a matter of time until a few people with long memories recall the foreign financial revelations of the 1996 Clinton presidential campaign. The China connections then had little to do with dinner plates. It was in those revelations the public first learned of the Clinton’s connections with big campaign donors like the Lippo Group’s Mochtar and James Riady who had long-time connections to a Chinese intelligence agency. The public learned about Yah Lin “Charlie” Trie, a major fundraiser and long-time close friend of the President, who accepted a plea agreement in return for telling how he had routed illegal donations from the PRC to the Clinton Presidential Campaign. Parenthetically, for those who think that America’s Indian tribes are morally above donating money to politicians to encourage the pols to stifle competition with tribal casinos, read the major heading The Indian Casino Decision. 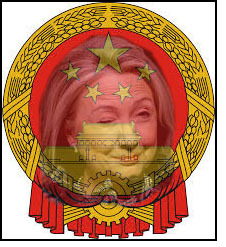 The Clinton’s have a long history of questionable ties to the People’s Republic of China. The PRC and its intelligence agency, the Guoanbu, have long memories and very likely meticulous records, maybe now including some emails from Hillary Clinton’s private email server, of who received how much money from whom. It has been almost 20 years since the 1996 Clinton-Gore campaign finance scandal. For most of us, that’s a long time. For the ChiComs in the PRC, it’s the wink of an eye. According to CNN (http://money.cnn.com/2015/05/18/news/economy/china-us-debt/index.html) as of May 2015, China owned $1.261 trillion worth of U.S. gov’t securities. (Japan only $1.2269 trillion). Would not it appear, if China was keeping close tabs on Mrs. Clinton’s e-mail, that China was simply acting with due diligence as a creditor of the U.S.? I’d hate to think whom the ChiComs would hire to collect the overdue debt! I’ve heard bout the Clinton machine – didn’t know it was made in China. It wasn’t made there; just paid for from there.